Yay! The official start of the fall season is less than a week away and I’m ready to celebrate its arrival! The temperatures are slowly dropping, all the kids are back in school and I saw the first pumpkins for sale last week. I know it’s a little early, but I just had to buy a few. It’s almost time to make those pumpkin pies and seeing all the fall decorations reminded me to stock up on a couple of extra cans of pumpkin puree for Haley too. 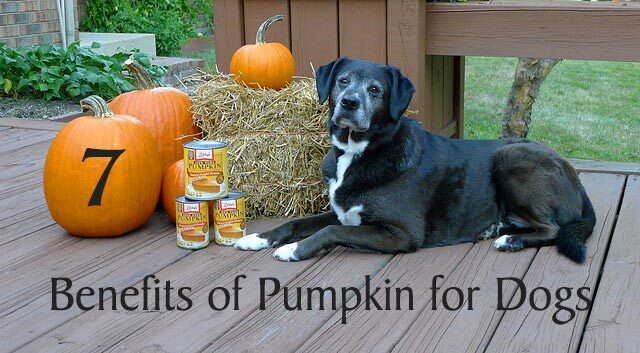 If you haven’t heard of the benefits of pumpkin for dogs, you’ll want to check these out! 1. Pumpkin is great for helping to relieve digestive issues in dogs. A lot of dog owners already know that pumpkin can help remedy diarrhea, but it’s also good for relieving constipation in dogs. Dogs that have IBS or require a bland diet may benefit from adding pumpkin to their food on a regular basis. Dr. Karen Becker explains more about how pumpkin is The Perfect Bowel-Soothing Food for GI Upsets and Diarrhea. 2. Pumpkins are full of healthy goodness. Pumpkins contain a lot of fiber while being low in calories, fat and cholesterol. You can tell by their orange color they contain a good amount of beta-carotene along with magnesium, potassium, iron, zinc, and vitamins A and C. That’s a lot of goodness wrapped in a festive, fall fruit. Yeah, it seems like it would be a squash, but it’s really a fruit. 3. Pumpkin seeds pack a healthy punch. Pumpkin seeds contain plant-based, omega-3 fatty acids and antioxidants along with other beneficial nutrients such as magnesium, manganese, copper and zinc. Animal studies have shown promising results linking the properties of pumpkin seeds to improved insulin regulation and urinary health (prevention of kidney stones) and in reducing inflammation. 4. Pumpkin can help manage your dog’s weight. Pumpkin can add bulk and fiber to your pup’s diet without adding a lot of extra calories. The extra fiber means your dog will feel fuller while eating less calories, all while getting the additional health benefits pumpkin has to offer. 5. Canned pumpkin is convenient. You can make your own cooked pumpkin puree but canned puree is convenient and available year round. It’s an easy way to add lots of healthy nutrients to your dog’s diet. 6. Most dogs love the taste of pumpkin. What’s the point of buying healthy food if your dog doesn’t like it, right? The fact that most dogs love pumpkin, is another reason why it’s a super food for dogs, especially if your pup’s upset stomach makes them picky about eating certain foods. Pumpkin is also unlikely to cause an allergic reaction in dogs that suffer from food allergies. 7. Pumpkin may have additional health benefits. Besides the health benefits already mentioned, pumpkin may also improve skin conditions and produce a shinier coat. Researchers are also studying whether the amino acid, cucurbitin, found in pumpkin and pumpkin seeds may be a natural dewormer for tapeworm and other intestinal parasites. Pumpkin is also good for cats! From aiding in digestive issues to preventing hairballs. It only takes a small amount of pumpkin each day to treat diarrhea or constipation problems in dogs and you need to be careful not to feed too much pumpkin because it is high in fiber. Normally the recommended amount is somewhere between a few teaspoons per day for small dogs to a few tablespoons or more for larger dogs. It’s important to check with your vet first to get the recommended amount for the weight of your dog and to follow up with an appointment if digestive problems persist. If you’re thinking about adding pumpkin to your dog’s diet on a regular basis, discuss this with your vet as well and remember to slowly increase the amount of pumpkin so your pup has time to adjust to the increased amount of fiber. Make sure you buy the plain pumpkin puree and not the pumpkin pie mix which has sugar and spices added to it. Since canned pumpkin only lasts for about a week in the refrigerator, here’s a great way to avoid throwing away any unused pumpkin. 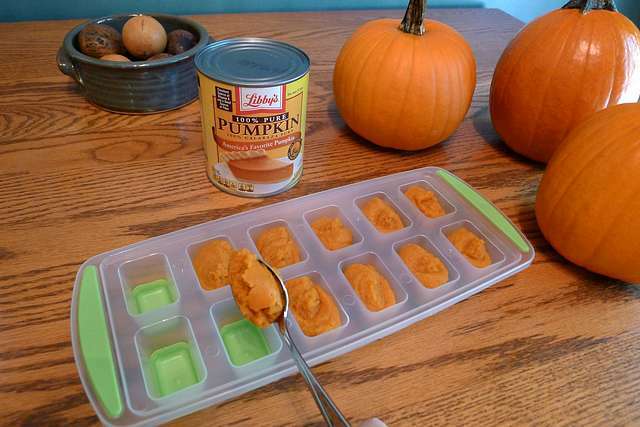 Simply freeze the extra pumpkin in ice cube trays and defrost them when needed. Never feed your dog carved Halloween pumpkins that have been sitting around because they’re likely full of mold and bacteria. 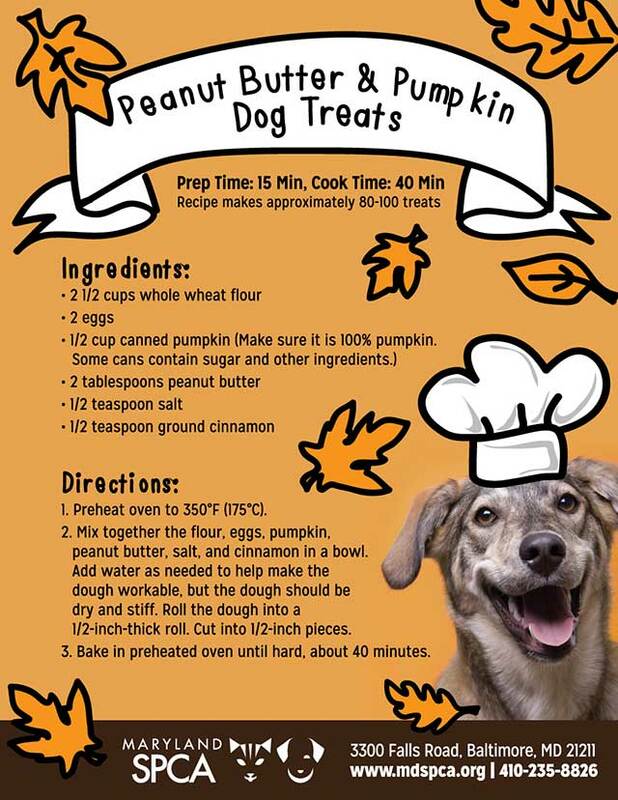 Try making some dog treats with pumpkin, like the recipe below from the Maryland SPCA. 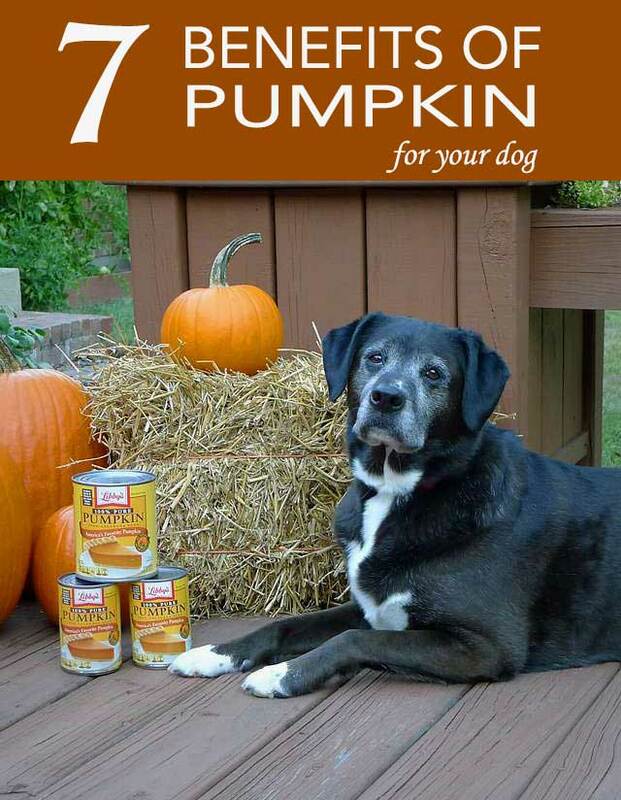 Always keep a spare can of pumpkin puree on hand in case your dog gets an upset stomach, diarrhea or constipation. Do you add pumpkin to your dog’s diet? Have you ever used it to cure an upset stomach? Share your experience or tips on how you use pumpkin for dogs! Great post! I actually have in draft a lovely round up of pumpkin based dog treats. I hope I will finish it soon. Perfect! I’ll be looking for that on your blog soon. I’d like to find some new treat recipes that have a good amount of pumpkin in them. Thanks, Amber! Isn’t it amazing how pumpkin works both for diarrhea and constipation? We’ve got a bumper crop of pumpkins in our garden this year so appreciate the peanut butter pumpkin dog treat recipe. We’re going to try it! It sounds like you could load your entire freezer with pumpkin cubes and dog treats! That’s awesome. ? Pumpkin really is an amazing, super food for dogs. Now I just need to find some new recipes for us humans. We love pumpkin here and often add it to different things. Only thing better- pumpkin and peanut butter, pumpkin and bacon and pumpkin and banana. I think the whole family would love those treats so I’ll try them. I make soup for Kilo and great idea on freezing. Pumpkin soup sounds interesting, I’ll have to look for a recipe for that. Pumpkin and banana sounds really good together too. Thanks for the ideas! Yes!!!! We LOVE pumpkin at our house!!! I love that picture of the dog with the photoshopped chef hat. It’s the perfect “Treat?! ?” face! Haha, you’ll have to try the recipe and see if Chewy has the same look! ? Oooh, pumpkin! We LOVE it! Yes, Haley’s eating one of her frozen pumpkin cubes right now since it’s a warm day today. Chops loves pumpkin. He went on a diet a couple months ago and pumpkin has helped him lose 2.4 lbs. I must say he’s had better luck then I have. I alternate pumpkin with chopped low salt green beans. He doesn’t get as excited over green beans but he never leaves any behind either. Way to go, Chops and Sharon! Most people might gain a little weight when they go on vacation, but Chops gained weight while “you” were on vacation, lol! I’m glad the pumpkin and green beans are working their magic though, a 2.4 pound weight loss makes a big difference on a little dog. He’ll be strutting his trim and fit body on those neighborhood walks now! ? I never realised pumpkin had so many wonderful benefits! Love the look of the dog treat recipe – definitely something to try! I love all things natural and avoid chemicals where I can, so pumpkin would be an excellent thing to sometimes include in Cody’s diet! I hope you like the recipe. It’s easy to make a batch or two and they last a long time in the freezer. Pumpkin waffles sound really good! I’ll have to look up some recipes and try to incorporate more pumpkin in our diets too. LOVE the canned pumpkin! We always have it in the pantry! So many uses for that stuff! I love that it’s super convenient and so healthy too! We’ve used pumpkin to help with digestive issues and it works wonders. I always keep a can or two on hand, just in case. Have you also given pumpkin to your cats? I wish I would have known about the benefits when we had our cat, Bleu. He used to have a lot of hair balls and maybe it would have helped. Yes & Yes! I first found out about pumpkin puree and its wonderful benefits when looking Buzz had an upset stomach a few years ago. Since then, the pups get a tablespoon of the orange goodness with each of their daily meals (2). We always have a few cans of it in our pantry! Great post, and I love your icecube idea!!! Thanks, Barbara! It’s amazing how quickly pumpkin seems to clear up digestive issues and I’m glad it worked so well for Buzz too. I’m going to start feeding a little to Haley every day too. Hooray for pumpkin! I open a can and freeze into ice cube trays, as you do, and Sinead gets a cube with her lunchtime meal. She loves the taste, as that’s the first thing she eats. I love having the frozen pumpkin cubes too, Jean. It’s so convenient. ? Mr. N is weird. He doesn’t like pumpkin so I have to hide it in his food. I was surprised too that pumpkin is also good for cats. I sure wish I knew that for our cat that had all those hairballs. Huh! I’ve been hearing a lot about pumpkin and pets lately. ‘Tis the season, I guess. I don’t even know if our Jake and Jessie like it or not. I guess it’s time to find out, since it’s so beneficial. Thanks for the heads-up! You’ll have to let me know if Jake and Jessie like it. I’m not one to jump on every food or supplement that’s suddenly supposed to be good for dogs, but pumpkin really seems to be a superfood for pups. Wow!! Great information! Thank you! I’m going to get some ready for little Murphy! I love the smell of pumpkin too! I can’t wait to meet Murphy in just a few weeks. So excited! ? Great post!! I love pumpkin and so does the SS gang. Thanks, JoAnn! This time of the year there’s pumpkin everything, everywhere. ? Pumpkin is a mainstay for us. The dogs get about a tablespoon at each meal to help them feel full. Since the warehouse clubs are full of pumpkin this time of year, I stock up on the large cans. I usually end up with 6 to 7 cases and that lasts me through the year. I also put a dab on pumpkin on the top of their Kongs before freezing. Truthfully though, I did not know it was good for diarrhea. That’s a great idea to stock up on cans from Sam’s Club or Costco! I could make big batches of those frozen pumpkin cubes. ?